Ester oil will tolerate traces of one of the other types, PAG will not. Your rebuilt compressor may contain any one of the above but its most likely PAG-46 (46 is the viscosity). Documentation or a tag should confirm the oil type. If you're not sure, drain and fill with mineral oil to be certain it will be compatible with the mineral oil and R12. I had the same situation. However my “rebuilt” A6 compressor was short lived. So I rebuilt my original A6 with new seals throughout. I found that the newer synthetic refrigerant oils will work with either R12 or R134A. I bought a quart of it from Amazon and used it. With your rebuilt A6, drain all the oil from it by removing the small drain plug on the bottom. Let it drain for an hour or two to make sure all of it is out. Follow the instructions on your car’s service manual when it comes to replenishing the oil. If memory serves me right, I think it calls for 6 to 8 ounces. You’ll need an oil squirt can to put the oil in through the small oil in the drain. I would highly recommend you replace the refrigerant hoses if you haven’t already, even if they’re not leaking. I run R12 in mine and it works fantastic. Also make sure you replace the drier too. Good luck. You can never be sure what they put in the rebuilt A6, or the quantity. If you drain it and refill it with the right quantity, you’re making sure it’s correct. If you need to get oil, try Estercool FJC2432 Advanced Refrigerant Oil (Quart). It’s compatible with all oils & refrigerants used in auto AC. Amazon sells it. Ask who ever rebuilt it what they used. 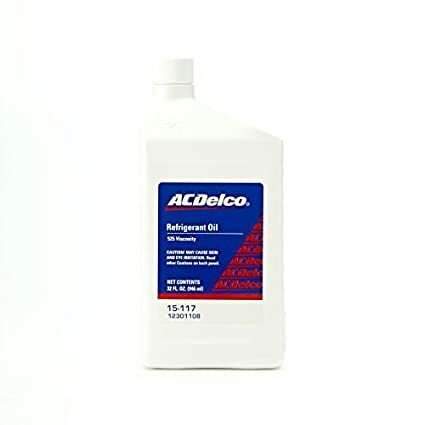 Lacking that, I would only use the 525 AC Delco oil if you are going to be using R12. Keep in mind, that the integrity of the entire system is dependent on the oil in your system, along with the R12 refrigerant. Is it really worth saving that small amount of money gambling on an unknown product. If you blow up this compressor, it is going to cost a much larger sum to get it functioning again. The choice is yours to make, and given the fact that you have very little experience with air conditioning servicing, it is a crap shoot if you will do it correctly unless you get some guidance from people that have that experience. If it were my compressor, and I didn't know what oil was installed by the rebuilder, I would be tearing it down, and flushing all remnants of the present oil in the compressor, and then resealing it with a new ceramic seal and Viton O rings. I would also be replacing all the lines, and flushing the copper lines, testing the expansion valve to make sure that it isn't defective, new receiver drier, and properly torqueing the new hoses per the OEM specifications. Then I would be pressure testing the entire system with nitrogen before even thinking of installing 5 pound of R12! Given the cost of R12, and the fact that the car takes 5 pounds of refrigerant, you are going to have a large amount of money invested and a $20 bottle of oil is going to be cheap by comparison. > auto AC. Amazon sells it. There are companies that sell oils (both ester and PAG) that are advertised as being “universal” that can supposedly be used in anything (except the hybrids referenced above) and with both R-12 and R-134a. But their use is a recipe for potential problems. There is a difference in the viscosity (thickness) of PAG 46, PAG 100 and PAG 150. You can actually see the difference by observing each being poured from their respective containers. With that being the case, when utilizing a universal oil you can end up with one that is too thick for some applications and too thin for others. While that may not make a big difference with some compressors and the oil may work, there are others where the correct viscosity is critical, and the use of anything other than what is recommended can cause excessive noise or premature compressor failure. Also, if you just need to add some oil to a system, it isn’t a good idea to mix different types of oils, as you would do if you add universal to an R-12 system that contained mineral oil. With all the lubrication problems that can be encountered with R-134a systems, a “one size fits all” approach isn’t a good one. Plus, using anything other than the specified viscosity of PAG oil in systems that require it voids the warranty from many of those compressor manufacturers. The manufacturers spend large sums of money doing research to determine the proper viscosity oils to use with their compressors. To avoid the possibility of voiding warranties and reduce the likelihood of premature failures, it’s necessary to stick with their recommendations. The Mobile Air Conditioning Society’s blog has been honored as the best business to business blog in the Automotive Aftermarket by the Automotive Communications Awards and the Car Care Council Women’s Board! Even though this above article is for R134, the same principles apply to R12. If you use a "fits all" oil, and ever have to have your system refrigerant recovered by a professional service facility, they will not do it once they test your refrigerant for contamination. R12, use the correct mineral oil. R134, use the correct PAG oil. If you just don't care, then use whatever oil you want, and why waste your money on R12, just fill the system with Propane. It will cool almost as well as R12, but make sure to have a big fire extinguisher near by. One of the reasons I went with R134a (plus I used the Sanden compressor) is that only a few shops in my area will deal with R12 now. It's just not that common anymore and shops have to have separate recovery and charging equipment. the shops that do R12 work charge a hefty price. Also if R12 can't be recovered due to contamination you'll pay a price to have it deposed of. If I sell my car I figure the buyer will want a system he can get serviced easily. However if you do your own A/C work and plan on keeping the car a long time then R12 is fine. Well everyone is entitled to their own opinion and apparently junkman thinks the oil I used isn’t compatible. I can only say that my R12 AC is working quite well in Florida and possibly aside from Arizona, there aren’t too many other places that have more heat. PAG, ester and mineral oil aren’t synthetic lubes, and possibly that’s the difference. It’s working very well for me but perhaps it won’t work for those in the northeast with much colder temperatures. As to asking the source of your rebuilt compressor what oil was used, it would be assuming the reseller rebuilt it. I doubt that’s the case. More likely someone in Bejng did the work. Very little rebuilding is still done in the US. > fire extinguisher near by. I've been running hydrocarbon refrigerant in three old R12 vehicles for over 15 years now and I do my own A/C work. Cools down nicely here in the desert. You should be more afraid of what's in the fuel tank than what is in the A/C system. Plenty of people are killed or injured by their gas grills each year but no one is up in arms about that. You’re right about that, azdave. I bought some of that, actually a case of it. It’s a combination of isopropane and isobutane and is claimed to outperform R12. I just haven’t run out of R12 yet, or gotten the courage to use it. But I have 12 cans of it. They claim a 6 oz can of it equals 14 oz of R12. Like you, I do my own AC work. R134A works OK but the pressures are a bit greater and the condenser has to dissipate more heat. The new R1234yf (or something like that) has even greater pressures. Mercedes is experimenting with carbon dioxide. I thank all of you who answered my questions. > out of R12 yet, or gotten the courage to use it. > experimenting with carbon dioxide. Edited 1 time(s). Last edit at 11/23/2018 09:07AM by 66vairman. I know, picking nits, but you want a CO detector in a Corvair. We already know CO2 is in the air inside. Unless someone placed a block of dry ice inside the car, then a CO2 detector would be nice. > the car, then a CO2 detector would be nice. Opps - Thanks Frank - hadn't had my wake up coffee yet. CO it is.